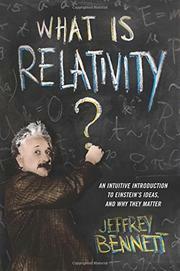 Understanding the universe requires understanding relativity, and this slim volume does an admirable job without resorting to the gimmicks or magic show common in the Einstein-for-laymen genre. “Much of the difficulty that most people have with relativity,” writes astrophysicist Bennett (Math for Life: Crucial Ideas You Didn't Learn in School, 2012, etc. ), “comes about only because it seems to run counter to ideas of space and time that have become deeply ingrained in our minds.” What’s relative in relativity, he writes, is motion. Its foundation rests on two absolutes: 1) The laws of physics are the same for everyone and, 2) the speed of light is the same for everyone. Readers will share Bennett’s amazement at the weird consequences of the latter. The faster an object moves, the more its length contracts, its mass increases, and time slows. If it reaches the speed of light, which is impossible, time would stop. These are facts, and experiments verify them. Modern technology, such as GPS measurements, must take relativity into account. Bennett begins with special relativity, which explains constant motion. It’s so simple that the required math does not go beyond high school algebra. Far more complex, general relativity explains accelerated motion, which is (another Einstein discovery) identical to gravity. Laymen describe gravity as an attraction between objects. Scientists since Isaac Newton agreed, but all hated the idea of an invisible force acting across empty space. Einstein solved this problem by revealing that gravity is the natural consequence of curved space. The greater the mass of a body, the more it warps nearby space into a fourth dimension: time. We can’t see this dimension, so it appears that heavenly bodies are moving in odd directions when they’re simply following the straightest path through spacetime. A sober, comprehensible account of what every intelligent layman should know about space and time.